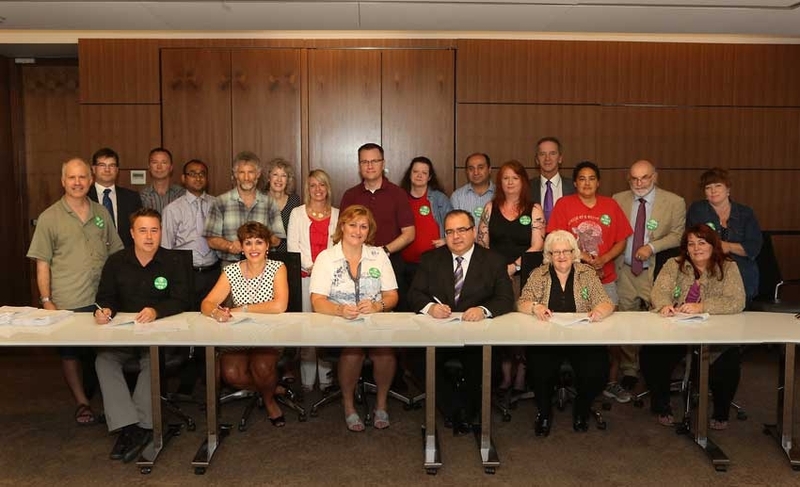 On June 19, McGill and MUNACA/PSAC signed a five-year collective agreement ending November 30, 2015 (the previous collective agreement expired on November 30, 2010). Members will receive salary increases of 1% (Dec. 1, 2010); 1.2% (June 1, 2011); 1.2% (June 1, 2012 with the integration of a new 22-step salary scale); 1.5% (June 1, 2013); 1.7% (June 1, 2014) and 2% (June 1, 2015 with the integration of a new 12-step salary scale). MUNACA/PSAC has close to 1700 members representing lab and IT technicians, support staff and library assistants. All members of the University’s bargaining team were present for the signature including members of MUNACA’s bargaining team and other representatives.